This is packaged in 1 Pound Packages. Also available in 5 pounds and 10 pounds. Please contact us for pricing. This soap base can vary from clear in color to a yellow/orange translucent color and does have a little odor which is not unpleasant. It does not seem to alter the fragrance that you are adding to it. It holds fragrance oil, stronger essential oils and color very well. Aloe Vera by itself is a powerhouse of concentrated and natural nutrients. This is part of what makes aloe so beneficial to the system. Rich in all essential vitamins, macro minerals, trace minerals, enzymes, amino acids and dietary fiber, aloe cannot be beat. 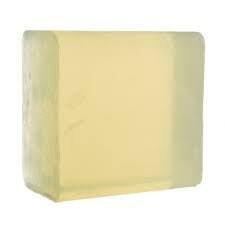 Dry skin, rashes, dandruff, eczema, psoriasis, oily and flaky skin can all benefit from aloe vera soap. Aloe vera soap is therapeutic and safe for just about everyone, from babies to the elderly. 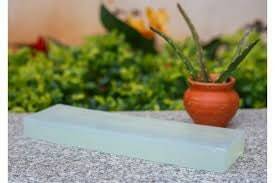 Aloe vera soap is a wonderful addition to the treatment of bug bites, insect stings and sunburn. Most photographs that we use are stock photos. THE PHOTO REPRESENTS THE SOAP BASE NOT THE PRODUCT PICTURED. This one is my favorite soap. It has big lathering suds and it is moisturizing. It makes beautiful bright color soap when adding coloring to the soap, plus hold fragrance very well. Arrived safely today thank you!